Propaganda means ideas, facts, or rumours spread to damage an opposing force. Propaganda posters are not only made to provide information, but to also influenced people's opinions. Propaganda posters are powerful to the readers, and can send across the actual message the auother really means. 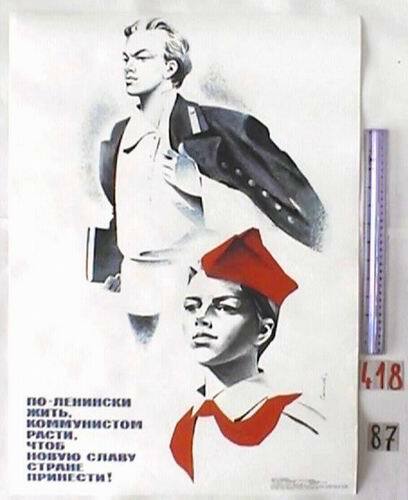 Propaganda posters were also used in Russia during the Russian Revolution. 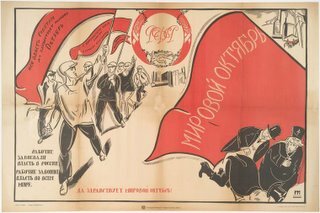 These posters were used by the Communist Party to spread the idea of Marxism and to represent the different leaders of Russia. This poster represents a teen Lenin (upper) and a pioneer (lower). The message this poster is trying to get across is to live like Lenin and grow up to become a communist to bring forth development to the country. The upper boy is holding a book and dressed up like a professional to represent how smart and how knowledgeable Lenin was; while the boy in the lower conner is dressed in normal clothes but has red cap and scarf on. The lower boy who represents a pioneer is nothing compared to the upper boy who looks more elegant and well educated. Even if the lower boy does not look as elegant as the upper boy, both of them are determined to face the challenge which awaits them in the furtue. This propaganda poster is about Lenin. Lenin's picture is in the center with red surrounding him. The message this poster is trying to get across is how powerful Lenin was; by showing his picture alone surrounded by red all over. Lenin's facial expression is serious with determined eyes. The person who drew this picture is trying to tell the aduiences how strong and dedicated he was to rule the country with success. 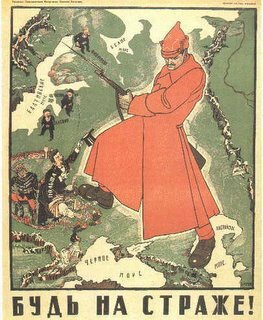 This poster represents the Civil War in Russia 1918-1922. It demonstrates the worker conquering power in Russia and will soon conquer power in the entire world. The workers or peasants are rebelling against the government in the October Revolution led by Lenin. The flags the peasants are holding (in red) represents power and strength to overthrow the government. In this propaganda poster, some peasants are wearing black shirt which represents the combination of power between the black and the white. This propaganda poster was drawn on November 1920 by an unknown artist. 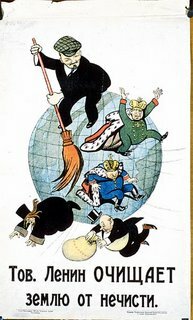 This picture represents Lenin (the person with the broomstick) wiping out all the upper class men and creating equality between all the classes. Lenin is trying to make all the people equal no matter from which type of ranks they come from. The message this poster is trying to demonstrate is the equality between everyone, no matter how rich or how poor you are; towards the end, everyone is equal. 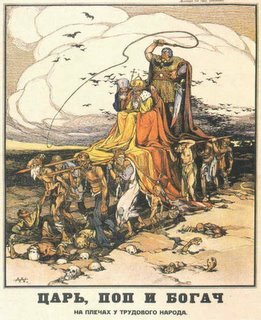 This poster signifies the way Nicholas II ruled the country. The top most person is Nicholas II (the person with the rope, and in dark yellow shirt). Below him are the citizens of Russia suffering from hunger and diseases. The huge clouds and brown sky demonstrates how much the citizens suffered from Nicholas II poor leadership. The birds flying around in the sky represents freedom that the people wanted. I think this picture clearly signify the harsh conditions the citizens faced during the rule of Nicholas II. This propaganda poster represents Trotsky in the red dress. The message this poster is trying to get across is how strong and smart Trotsky was to win the battle against the White army. The red dress of Trotsky represents power and his ability to lead the nation into success. This picture also shows us that Trotsky's army is bigger and wealthier then other armies; and no other army would be able to defeat him and his strong army. After viweing many different posters about Russian's propaganda, I saw that these posters were made to demonstrate each party's stength and weakness. These posters were made to compete between each party showing who is better; and to destroy the party's enemies by showing their weak points. 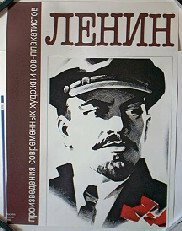 For example the governemnt might show posters of Lenin as a traitor to the country. This is done to destroy Lenin and to destory the trust people have for him. In conclusion, I think propaganda posters were made to destroy the enemies and to priase the party (group) which made those posters.